ARMSLIST - 420 RDS FEDERAL 5.56MM 62GR - $118.99! 420 RDS FEDERAL 5.56MM 62GR - $118.99! 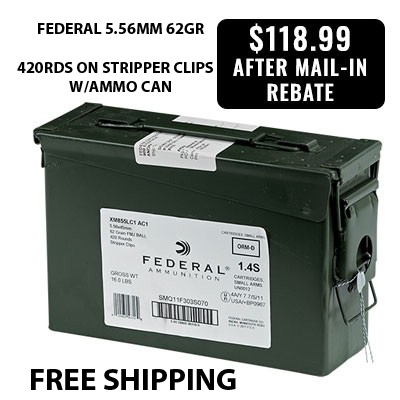 420 RDS FEDERAL 5.56MM 62 GR ONLY $118.99 WITH FREE SHIPPING! CLICK NOW TO GET YOURS! Maybe it is just me, but is anyone else having an issue reaching the site after"clicking here"? I keep getting the response the site cant be reached.